This Eaton Weatherhead 1873X6X6 air brake tubing bulkhead union fitting is suitable for connecting air brake tubes to male NPT-threaded pipes and fittings through a barrier in air brake systems. It has 3/8" female National Pipe Taper (NPT) threads on one end, a Department of Transportation (DOT) push-in tube receptacle on the other for use with 3/8" outside diameter (OD) tubes, and 3/4-16 outer Society of Automotive Engineers (SAE) threads for mounting through a container wall or other barrier. 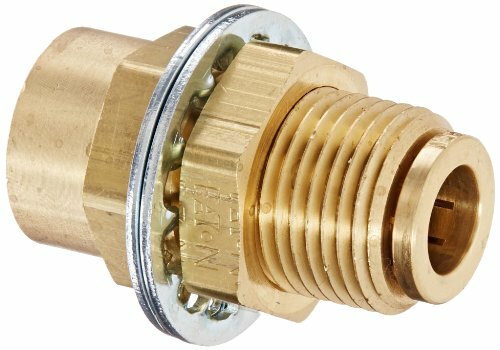 The fitting is made of CA360 brass for strength and resistance to corrosion and has an operating temperature range of -40 to +200 degrees F (-40 to +93 degrees C). It has a vacuum pressure rating of 150 pounds per square inch (psi) and meets DOT FMVSS 571.106 and SAE J1131 standards for air brake system performance. This air brake tubing bulkhead union fitting is suitable for use in air brake systems for trucks, buses, trailers, railroad trains, and other large vehicles where temperatures do not exceed 200 degrees F and battery acid cannot drip on tubing. Tube fittings are components used for connecting, branching, terminating, and changing the direction of tubing in pneumatic and hydraulic systems. They are made of brass, stainless steel, PBT (polybutylene terephthalate), and other materials that resist corrosion and wear. Tube fittings have various types of connections, including threaded, welded, barbed, and push-to-connect (also called one-touch). Push-to-connect connections do not require tools or sealants. Tube fittings are used in various applications, including machine tools, airplane and truck controls, and automated production lines, among others. If you have any questions about this product by Weatherhead, contact us by completing and submitting the form below. If you are looking for a specif part number, please include it with your message.